On my list of things to do someday (in the not to distant future): go to the South Beach Food and Wine Festival. Why? Rachael Ray makes an appearance there, that's why. Don't you know me at all? 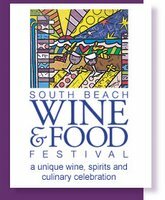 There is no comparison to an international event like the South Beach Wine & Food Festival. All of our chefs are in one place, and consumers can reach out and touch them," said Brooke Johnson, President, Food Network. "The festival allows viewers to experience the network, our stars and most of all, have a great time." Some of the world's greatest culinary superstars and wine and spirits personalities will again converge in South Beach for three days of non-stop food and wine indulgence. Confirmed Food Network chefs include Michael Chiarello (Easy Entertaining), Giada De Laurentiis (Everyday Italian), George Duran (Ham on the Street), Bobby Flay (Iron Chef America), Emeril Lagasse (Emeril Live), Tyler Florence (Tyler's Ultimate), Dave Lieberman (Good Deal), Rachael Ray (30 Minute Meals), Dan Smith and Steve McDonagh (Party Line with the Hearty Boys). This proven festival provides a unique business opportunity for the network to showcase its talent to advertisers, clients and press. The 2007 Festival will also include a Food Network awards show where awards like "The One Food You Must Eat Before You Die," "Best New Food Technology or Gadget," "Top Food Lovers Destination," and "Food Network Hall of Fame - Lifetime Achievement Award" will be presented. And, surprise, surprise, Food Networks stars will be presenters. For more information, you can visit the Festival's website here. You have until now till February to save up for the trip!